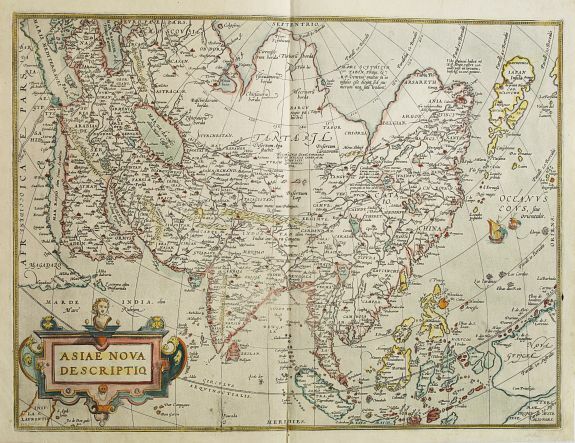 91 ORTELIUS, A. Asiae Nova Descriptio. Anvers, ca. 1570. Col. Fente sur 5 cm en bas du pli central. Impression un peu faible. - Split of 5 cm lower part centerfold. Impression slightly faded. 370 x 494 mm. 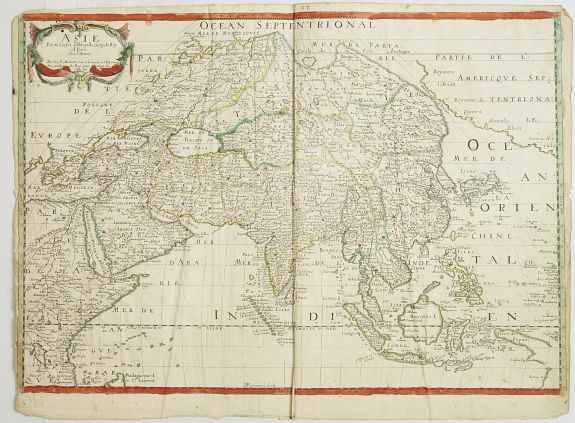 � Ortelius' fine map of Asia well represents the continent at a time when Europeans were expanding their power in the far east. The Indian subcontinent and Malaysian peninsula are easily recognizable. Ceylon and Sumatra are correctly placed. The Philippines are distorted and Japan is too far north and incorrectly orientated, with the embryonic outline of the three main islands and with the Ryukus and Taiwan appearing as a tail of islands to the south of the archipelago. - Van den Broecke, Ortelius Atlas maps, 7. 92 SANSON, N. Asie. Paris, Mariette, 1650. Beau col. ancien. Rousseurs, p�les mouillures, fente en bas du pli central (sans manque), d�chirure renforc�e anciennement (sur 5 cm � l'int�rieur du cuivre) dans la partie gauche. Bordures et cartouches colori�s � l'�poque. - Paper slightly age toned, split in lower part centerfold, minor water staining and brown spotting. Repair of split in left part, 5 cm into engraved area. 390 x 553 mm. � Carte d'Asie grav�e par A. Peyrounin, avec les bordures et cartouches colori�s � l'�poque. - The extensive northern landmass of Jesso, stretching across the whole North Pacific. 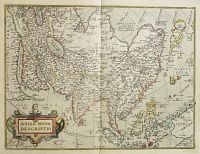 Map of Asia with scale borders and title-cartouches brightly coloured at the time of publication. The map is engraved by Peyrounin. 93 L'ISLE, G. de. / COVENS & MORTIER. L'Asie divis�e en ses Principales Regions. Amsterdam, ca. 1757. Limites en col. d'�poque. L�g�rement froiss�e au centre, petit accroc au milieu du pli central. 465 x 580 mm.